Strike down upon thee with great vengeance and furious anger in Ubisoft's God game. God games must be some of the trickiest to create, largely because developers must convince players of becoming all-powerful deities while adding a level of challenge that goes against the entire point of being the "almighty" to begin with. In other words, we highly doubt the real God (should he, she or it exist) worries about cool down times on his plethora of abilities, or finding himself in a situation where he could potentially lose. That said, it's important to suspend belief to enjoy these titles, the latest being Babel Rising 3D from Ubisoft, the follow-up to the underrated original app from Bulkypix. As the Old Testament says (rest assured the publisher took liberties with the original story), mankind attempted to construct a tower to reach Heaven and angered God in the process, forcing him to scramble their speech patterns and scatter them across the Earth. That's where you come in. As God, the goal is to prevent a variety of heathens from building said tower using powers from four elements, be it fire, water, wind and Earth, with thousands dead as a result of your wrath. To that end, most stages let you bring two of those aforementioned elements into the fight, all of which feature upgrades via coins acquired during play; yes, even God needs loot. From there, you swipe left and right to direct the camera around the 3D tower, which gives you a mostly decent view of the little buggers tirelessly carrying pieces of stone towards their destination. From there, it's all about tapping certain points on the screen to literally rain fire and brimstone. 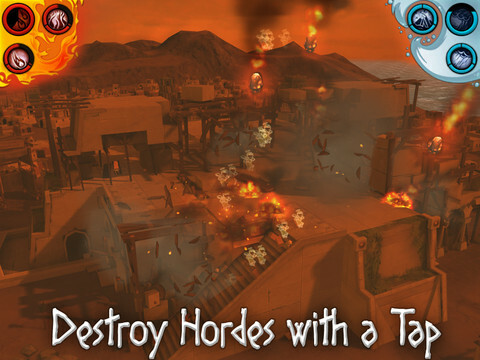 You can freeze the humans, whip them up with a tornado, drown them, unleash a burst of flames and even drop rocks onto their heads, and you'll do this across a variety of levels that task you with slaughtering a certain number of heretics or simply preventing the tower from being built. Not a bad game by any means, but one that needed some additional polish before being sent to the App Store and Android Marketplace. The most annoying issue comes from the touch controls, which ask you to press and hold one side of the screen, then sweep a finger across desired targets with the other hand to launch more powerful attacks. It works most of the time, and that's the problem. We expect it to function all the time, and this simply isn't the case. We'll go to spread fire around the screen, only to watch as said fire either doesn't appear, or goes someplace unintended. This proves critical during more intense moments in the game, since all of these moves come with cool down times, forcing us to wait until they're ready again, not exactly the best position to be in as pesky humans are mere seconds away from finishing the tower. The fact that the game forces players to outlast these virtual people for specific periods (try 10 minutes) makes having to restart especially irritating. 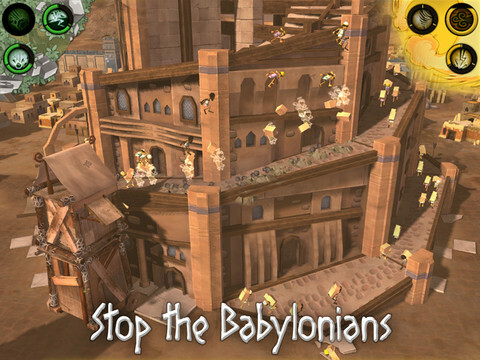 What's more, there's little about Babel Rising 3D that changes over time. Yes, the towers become more complex and the humans come up with new ways to fight back (priests, for instance, deflect certain elements), but by and large, things mostly stay the same. As for in-app purchases, everything costs money to upgrade. Ubisoft was wise to give players a generous amount of coinage for completing stages, and they can always replay those boards for more, but IAP seems a bit greedy, as the game already costs $2.99 and $4.99 on iOS and Android, respectively, not to mention to bizarre plot point of God needing cash to begin with. At the same time, there's still fun to be had. There's something cool about laying waste to multiple builders at once, and the option to shake the device to unleash super attacks makes the experience more interactive. On that note, Babel Rising 3D has enough quality content to command a look, but Ubisoft needs to implement some fixes for it to be considered divine. Review code provided by Ubisoft. What's Hot: Commanding elements to punish the weak, elaborate 3D towers, watching dead people's spirits float away, upgrading attacks. What's Not: Imprecise touch controls, losing at the last possible second in a nine-minute stage.